Get access to cashflow with the AWB Production Advance. It’s a simple program that gives you a prepayment on forward sales to AWB. From the time you plant your crop, the AWB Production Advance can be used to cover any of your production and input costs. Don’t wait until harvest to settle your production costs. View the one page AWB Production Advance summary brochure. An alternative to debt – access up to $100/tonne on wheat and barley, and up to $200/ tonne on canola forward sales to AWB. Transparent fees – A published monthly fee based on commodity forward sold and there are no hidden fees. Automatic repayments following delivery at harvest. Commit grain to AWB pools and lock in your preferred pool program later. See how to switch your pool contract. 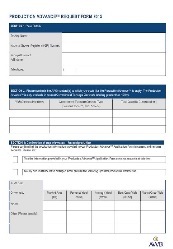 A simple process to apply and access the Production Advance program. 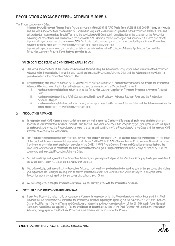 Note: If you already hold an AWB forward contract you are not required to complete step 4. Fees are published on a dollar per tonne basis and are inclusive of GST. AWB will calculate the total fees payable and deduct the fees from your payments due to you at harvest following delivery of grain or oilseeds. The following criteria are important in determining eligibility for the Production Advance. Available to customers who hold a relationship with an AWB Representative. 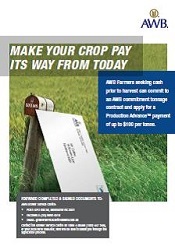 AWB forward Fixed grade or Multi grade cash contracts for wheat, barley or canola. All contracts must have a delivery end date prior to 30 April following harvest. You must have entered into a contract with AWB for a minimum of 100 tonnes. The Production Advance is available until 30 November each year. Forward contracting limits apply and change across the year. For example in June your forward sales (by commodity) should represent less than 30% of your forecast production for that year. The Production Advance is to be used by you wholly or predominantly for the purposes of enabling you to produce the crop which is subject of your forward sales contract. You must meet certain financial eligibility criteria determined by AWB. You must hold or will purchase a crop insurance policy for the current season. If you are unsure whether you meet the eligibility criteria please contact your AWB Representative or the AWB Grower Service Centre on 1800 447 246. DISCLAIMER: This information is of a summary nature. It does not purport to be comprehensive or complete. Nothing on this website is intended to constitute financial, investment, tax, legal or any other form of advice, recommendation or a representation that any transaction, or otherwise is suitable or appropriate for you. Entering into an eligible AWB forward sales contract does not automatically entitle you to receive the Production Advance. If you would like further details including the terms and conditions please contact the AWB Grower Service Centre on 1800 447 246.